So what do you do if you LOVE peonies but you’re not getting married in season. That’s May-July by the way. No problem. Just fake it. Here’s a handy tip…..just use carnations. I know. I know. They’re the scourge of many a modern florist, best known for their presence on the petrol station forecourt. But they are making a comeback honest. And if you’re careful using the right colour and tone, they can be turned into the most convincing blousy peony. Particularly handy when the cost per stem is too high or it’s the middle of October. There’s basically two different methods; 1) The Cut Down and 2) The Tie Together. 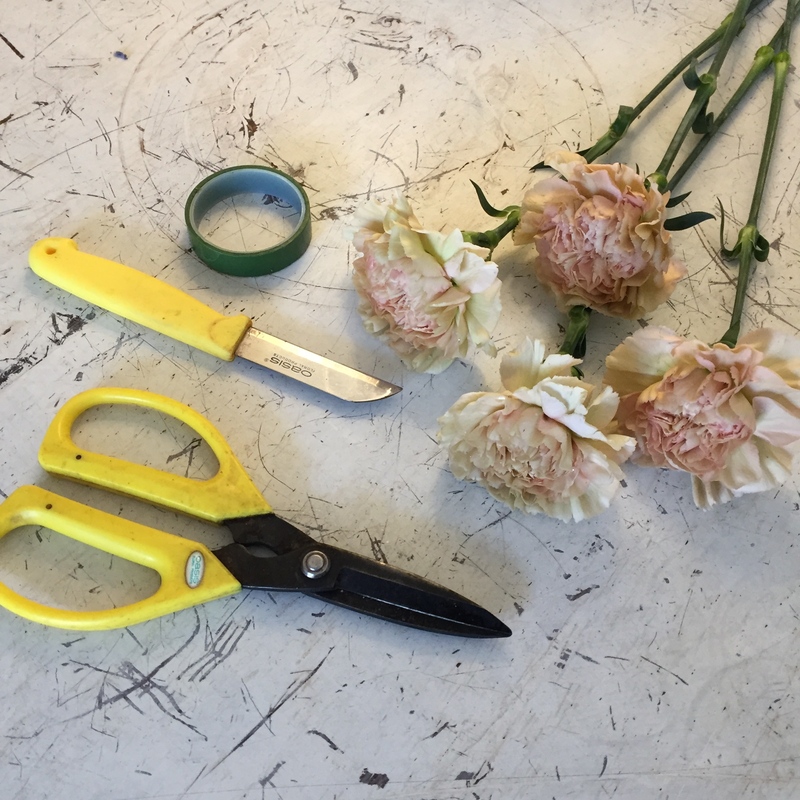 In the image below, you can see three flowers; far left is the original sized carnation still in tight bud (the older the carnation, the more full the effect), middle is the cut down method and the far right is the tie together method. Take a single stem carnation and using a florist knife cut down the green part that connects the petals to the stem. The part that holds the blossom all together). Cut clear from the top to the bottom. Stop at the part that attaches the stem and only cut through the green part. Use your fingers to “fluff” the flower out. Since you’ve cut the base of the stem, the petals now have a little breathing room and can properly spread out. That’s it! The more you fluff, the fuller the bloom. I’ve used one tone carnations but this method looks even better with variegated carnations. Hold three stems of carnations together at the base of the flower head. Group each flower head together, placing and replacing until they perfectly fit in unison. Tape together. That’s it!! Talk about simple.